Barefoot 1 Day Atherton Tour is a great way to see the Atherton Tablelands for an amazing one day tour, full of laughs, good friends and beautiful sights. With landscapes including waterfalls, volcanic crater lakes and a natural waterslide, you'll have an amazing time that you'll not soon forget and make friends to last a lifetime. It's ideal if you are on a budget but want to see it all in one day, making it a perfect escape for a day of adventure and fun! Your cheeky tour guides will make sure you have a day full of laughs and new experiences and tell you all there is to know about this beautiful part of Australia. See Lake Eacham, Dinner Falls, The Crater, Millaa Millaa Falls and Josephine Falls! Free photos available on Facebook after your tour! Walk the walk with Barefoot 1 Day Atherton Tour for the experience of a lifetime in the Atherton Tablelands. Leaving from your accommodation in Cairns, you'll join your cheeky tour guide on board your home for the day (our loveable and comfy bus) and set off for a journey through the beautiful green Atherton Tablelands for a day of adventure. During your tour, you'll get to visit four unique locations: including Lake Eacham, Dinner Falls, The Crater, Millaa Millaa Falls and Josephine Falls: stunning and breathtaking places that will leaving you 'ooing' and 'awing' all day long! Swim in volcanic crater lakes, take a dip under breathtaking waterfalls and slide down a natural waterslide. 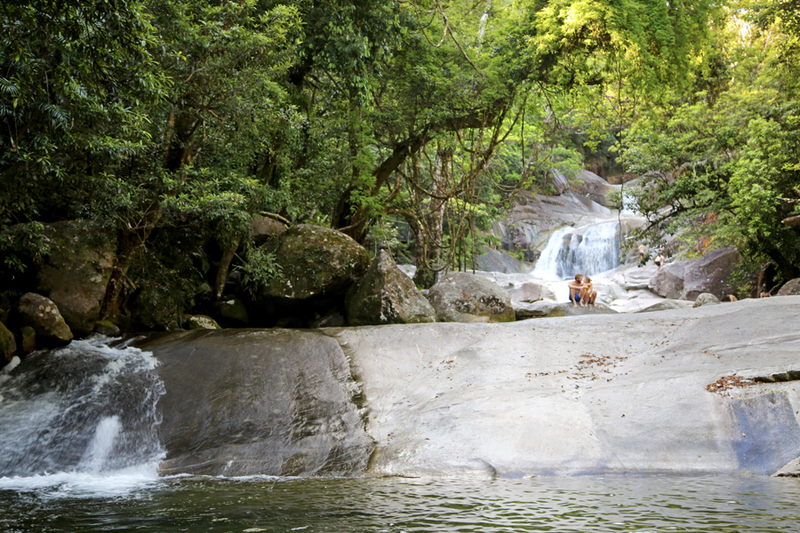 This is the perfect opportunity to swim and explore, as well as enjoy the natural surroundings of the Atherton Tablelands at their best. If youâ€™re not a fan of water, and are just along for the ride, donâ€™t worry, thereâ€™s still plenty for you to see and do with a full day of laughs, good company and a fun group of people. Enjoy morning and afternoon tea in the beautiful tropics and be blown away by the beauty of the tablelands while we take care of the rest. No age limit, but you must be reasonably fit and healthy and have a good sense of humour! Pickups from your accommodation in Cairns CBD are between 7-8am, and we usually return 7-8pm. Bring a small amount of money to purchase lunch at the cafe, or bring your own lunch if you prefer. All departures and itineraries are subject to weather. Tours may be changed or cancelled for any reason at the discretion of the tour operator. It should be noted that adventure travel involves risk. Whilst we make every effort to safeguard clients, we cannot be responsible for personal injury or loss due to actions of our clients which are beyond our control. We recommend that all clients have travel insurance covering illness, injury, loss or damage to personal belongings and not being able to travel on the confirmed date of departure. Also please note is select swag accommodation this is a camping experience so sleeping on deck open to the elements and weather. Please be aware operators pass on credit card merchant fees so there is a non-refundable 2.5% surcharge for VISA, MASTERCARD and AMEX card purchases. All client cancellations forfeit 25% of total ticket price and all client cancellations made less than 7 days prior to departure will result in complete forfeiture of the full price of the tour. If the tour operator has to cancel the trip (prior to the departure) and we cannot offer a suitable alternative, then a refund will be given minus card fees. We strongly recommend that you have travel insurance, especially during the wet season.